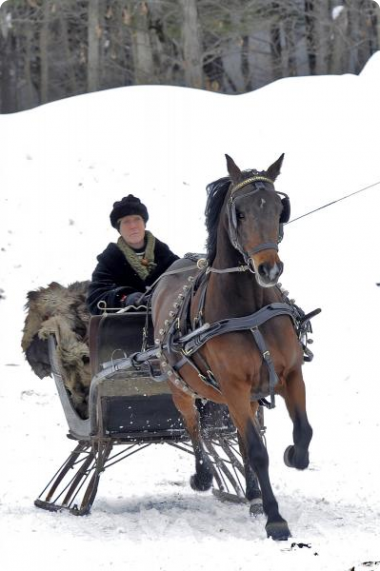 Prior to the arrival of the automobile, the arrival of winter snow meant the substitution of sleighs for carriages and the replacement of wheels with runners, with runnered vehicles gliding easily on hard-packed snow. Deep snows however were another matter and were sometimes difficult for horses to negotiate. In certain circumstances the snow could be downright dangerous. Following a storm in February 1883, the Middleboro Gazette recounted one story - part ghost tale, part animal rescue - that spoke to the dangers heavy snow could present horses. Two young men came over from East Taunton, in a sleigh, last Sunday, and left the team standing on Benton street, near Cornelius Murphy's residence. The horse became restive, and finally went off on his own account. It was between nine and ten o'clock that night, when John Driscoll's boys were going to bed., on looking from the window over the meadow between the house and the river they saw some dark object moving, and having read about a 'ghost on School street,' were affrighted, and called for the father. The father advised them to go to bed, and not watch the dogs any longer. But they protested, and said they knew it was not dogs, until finally Mr. Driscoll went out, with stout stick in hand, to drive off the dogs, when behold he found a horse lying upon his side in a snow-bank tangled up in the harness. He sent for help, and the horse and sleigh that belonged to the Taunton boys was rescued from a position in which the horse would have soon died. He ran through Lincoln avenue, and up by Mr. Churchill's residence, and over an embankment of five feet depth, overturning the wall, breaking the sleigh, and tearing off his skin in several places. The only wonder is that he was discovered at all. The Middleboro Gazette, "Middleboro", February 13, 1886, page 4.